Wouldn’t it be fun if you could just hang up almost any object on the wall without the need of fixing a hook before you do so? You can do that actually, with a really easy way known as magnetic paint. Basically the paint has magnetic qualities and you can hang it up conveniently and rearrange the look anytime you want. How cool is that? One of the first things you can conveniently make is a gallery wall to feature all your mementos and photos to be admired. With the magnetic paint, you can figure out how to make the arrangement work and look good at the same time. 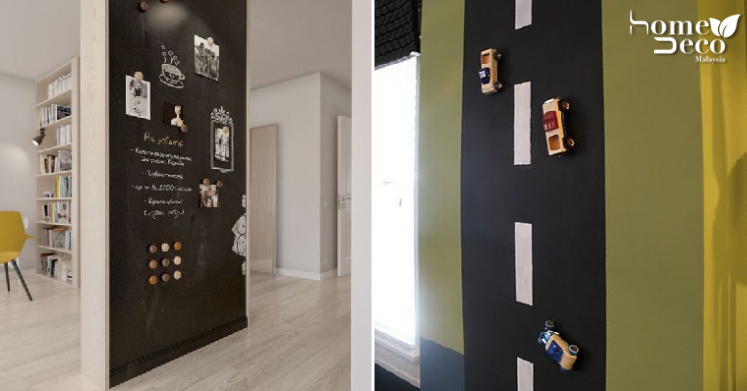 Since you can now hang up items easily on your wall, do it for your home office or kid’s study desk where they can attach any piece of paper they want. It can be a great memo board for reminders, photos or inspirational quotes as well. It can often frustrate you when your kids play with their toys and leave them all over the floor with no space to move. Well try giving them more space to play on the wall! Use magnetic paint to paint a nice race track and pretty soon they will leave the floor alone. Having a feature wall in your home can be a great addition as it looks really awesome and using magnetic paint is a stroke of genius. This means that you can dress it up anyway you like or change the look around whenever you like. One of the best things about magnetic paint is the versatility that allows you to let your creative juices flow. Paint your own piece of wall art using magnetic paint and affix anything you want to make it uniquely yours. If your makeup table is always cluttered then using magnetic paint is the perfect way to keep everything handy and neat. Attach magnets to the back of your beauty products and once you finished using them just put it back on the magnetic paint that you have framed nicely. Remarkable Yet Modest Home Design Just Under 50-Square Meters!